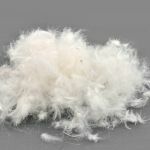 Japara is a 100% cotton down-proof material commonly used for insert covers when feather fill is used, due to its tight weave. Roll Sizes Available: 20m Roll & 100m Roll. Some smaller odd size rolls also available (enquire within).